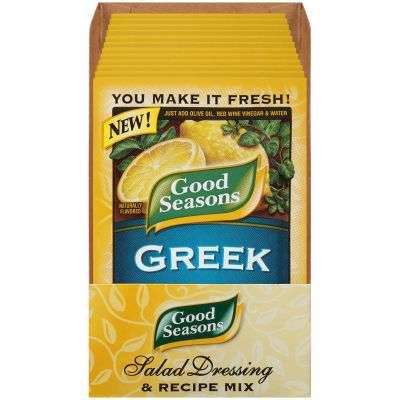 Good Seasons Greek Dressing & Recipe MixEnjoy the authentic and well balanced Greek Dressing and Recipe Mix. Now make mouth watering succulent salad dressings to add authentic taste of Italian cuisine.Perfect Fusion of Genuine FlavorsThe yummy and appetizing fusion of original ingredients and flavors used in Italian style are going to satiate your hunger for a perfect salad dressing with perfection of taste blends. Serving size 1/8 envelope (2.4g).